Impulse sealers require no warm up time and seals by applying a pulse of energy to the sealing area, followed immediately by cooling. Impulse sealers only use power when the jaw is lowered. 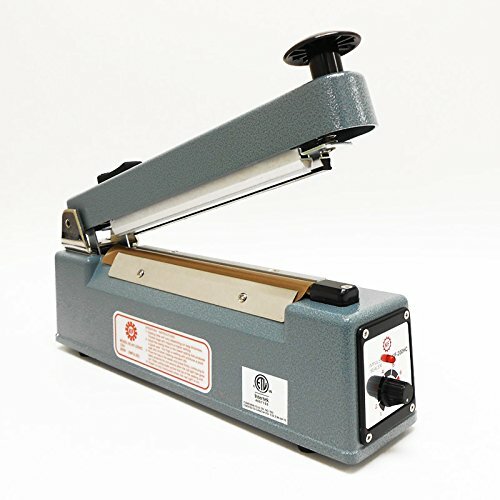 We recommend an impulse sealer for any thermoplastic material such as polyethylene (PE) or polypropylene (PP) which requires a lower seal temperature. Materials for impulse sealers: Polyethylene, Polyurethane, Polyvinylchloride, Pilofilm, Polyvinyl Alcohol, Saran, Nylon, bubble packs, padded mailers, foil, coated bags, Kel-F, Polyflex, Mylar, Tyvek, Surlyn, and other heat sealable materials. • Simple to use - No operator training. • LED sealing power indicator. • Adjustable timer for optimal seal control. • Seals bags made of any thermosealable material. • No Warm-up time necessary. • Machine Includes 2 Sealing Elements & 2 PTFE Sheets. • 8 inch (200 mm) sealing length. • 1/16 Inches (2.6 mm) wide sealing. • Can seal poly material up to 10 mil thickness. • Voltage: 110 VAC / 50-60 Hz. • Plug type: NEMA 5-15P. Simple to use - No operator training. Machine Includes 2 Sealing Elements & 2 PTFE Sheets. 8 inch (200 mm) sealing length. If you have any questions about this product by KF, contact us by completing and submitting the form below. If you are looking for a specif part number, please include it with your message.